I'm building a Lanier G-202...I have done some searching on this kit but have a question that I thought I'd pose to the masses...Hopefully someone who has experience with this plane will see this too!! The posts I've found about this plane are all from the early/mid 2000's before today's engines were available..They talk about using BME engines and other 75-80cc class engines on it...I think todays engines are both lighter and more powerful than what was available back then...For instance isn't a DLE 55 as powerful as a G-62?? So what do you guys think?? I'm pretty sure I won't get the plane below 21 lbs based on what I've read....Should I go with an 80cc?? Last edited by Atlanta 60; 08-22-2013 at 07:08 PM. That 35% Giles is quite a bit larger than the typical 50cc ARF produced today. I would go with a larger engine but would favor a twin for less vibration and it should easily fit in the huge cowl. I would also put the airframe on a diet to get rid of some of the excess weight. If you have a finished weight in the mid 20 Lb. range, it will fly quite well. The Giles flies very well but it was not my favorite of the Lanier planes. I much preferred the Extra, Laser or Staudacher (sp?) all of which I still have in my hanger. Thanks Again for the insight.. I built two of them back in the day, good flying airplane if you keep it light. If you work at it you can get this airplane down to around 17. 5 to 18 pounds with a DA 60cc or alike. Here is a picture of one of the two I built. Last edited by sensei; 08-23-2013 at 03:40 AM. I would probably use something like a DA100 or DLE111 but it will fly well with any of the big singles. I just prefer the smoother running of the twins for larger sized engines. Just a personal preference thing. As sensei said, it would fly with a DA60 if you can get the weight down under 20 Lbs. I wish I knew more about the DLE85 but reports are few about that engine. That might be a good choice also. As far as lightening the airframe, you could remove a lot of foam from the wing. The fuselage has excess wood everywhere that can be trimmed away. You can remove quite a bit without sacrificing any strength. Thank you guys!! Sensei, That is a beautiful plane!! Thanks for the kind words and I wish you the best on your build. Thamks a lot for the info!! Last edited by Atlanta 60; 08-23-2013 at 03:55 AM. Here is some food for thought on your wing and tail feathers. Nice work sensei! Did you use a router on the foam? All of the Lanier planes retained the wing panels with a bolt into the aluminum wing tube. This let the panels rattle against the fuselage side. I prefer to eliminate the bolt into the tube and in its place, retain the wings with two bolts on each side through the fuselage sides into blind nuts installed in the wing roots. Much more secure and makes for a quieter airframe. I make matching templates for each side of the surface, screw them on with course drywall screws, I then use a hot wire to cut them out one by one. Notice that the wing shuck is uncut and yet the wing core is completely lightened. I also retain my surfaces to the fuselage the way you speak of. Good deal about how you make the cutouts. The results look very good. My friend still has a virgin Lanier 33% Extra kit that I have considered building. I would probably try your technique if I did. I still have one of the Extras so really don't need another right now but it is a wonderful flying airplane ....even when heavy. It would be great at a lighter weight. If the attachment works, here is a photo of the Extra. 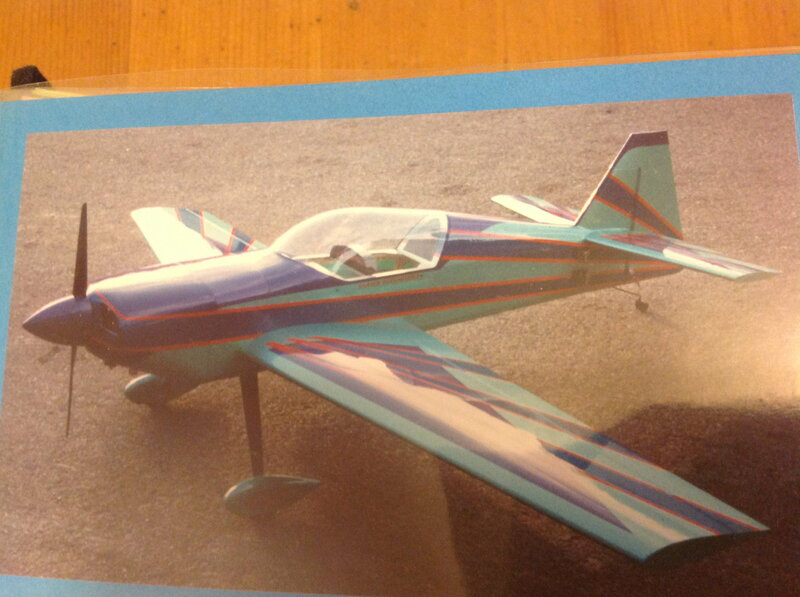 Very sweet looking airplane my friend and I love those colors together too. Atlanta - I am currently flying a Lanier G-202 35% with a Zenoah GT-80 twin. The aircraft is rock solid. Wgt. is 21 lbs. The aircraft is outdated by todays standards, but is a great IMAC trainer. Thanks You guys!! WOW Sensei, Those cut outs are Awesome!! Just found this thread which has quite old and was wondering if anyone was willing to part with their manual and plans or be willing to make a copy of the plans? I purchased a 95% complete Lanier Giles 202 35% about 11 years ago just before I stopped flying which was to be my first step into gas. The plane didn't have a manual or plans with it and now I need to finish the build and complete the setup. I'm not sure of CG, throws, etc.. I was hoping someone would come forward with a manual. If memory serves me, the plans were not full size. I built one in 1999. I unfortunately do not remember where the CG was but do recall that I laid up a very light weight cowl for it and still had to put the RX battery at the stab leading edge. The 3W 70 twin that I powered it with was a bit on the heavy side though. It was a nice flying airplane. I used it for IMAC so throws were a bit tame, it is not a 3D capable airplane. dont know when or if you will receive this message. i just came across one of these reasonable with glass parts. but no manual. did you ever find a manual and could i get copies. i will pay for a yes and be great full for even a no. tx pat! hello, were WE lucky enough to find someone with a copy of a manual. then if you were would you be able to pass it on or copies that i will gladly pay for which ever way it goes. found a nice kit with glass parts too but...no manual. tx for a reply either way. hi, any chance you have a manual? got kit, plans, glass parts but ............no manual. it's an old dead thread but maybe a little life still to go tx pat please give me a bump either way pics too !! When I built mine I don't remember ever looking at the build manual. It was a very easy build. I have the build manual but I'm in need of the plans. Any chance I could get a scan of the plans? I can get the manual scanned and email to you. Last edited by Going Balistic; 03-31-2019 at 05:02 PM. I will PM you for your number.